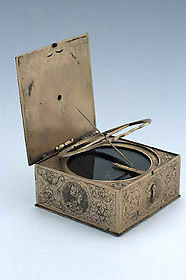 The compendium consists of a box for the compass and a hinged cover lid. Mounted on the cover is a hinged piece with trefoil aperture, to serve as suspension point of handle. Each side is engraved with foliate decoration on either side of a roundel containing a portrait head; two women and two helmeted men are depicted. The hinged cover is retained by a clasp and carries a nocturnal on its outward face. The nocturnal is constructed for a star whose right ascension matches that of the sun on about 13 October. There is a decorated, hinged index and a toothed volvelle with radiating lines for the hours IIII to XII to VIII, subdivided to half hours. The longer pointer at XII moves over a calendar scale in which each month is identified by its initial letter and divided to 5. A clasp in the form of a horse's head and neck is fixed close to the handle and its ear is apparently meant to engage with a scroll on the volvelle. The reverse of the cover is blank. The hour ring of an equinoctial dial is housed in a recess above the compass. The dial is intended for 3 latitudes and is set by placing the end of the cross- piece gnomon in one of three unnumbered indentations on a brass bar fixed over the compass glass. This arrangement prevents the gnomon from standing perpendicular to the ring. The hour ring itself is circular except for its ungraduated night time portion which is shaped as a scroll. The hours on the upper face are numbered 4, V to XII, I to VII, 8 and are subdivided for half hours. The lower face is numbered simply IIII to XII to VIII. Rather than a degree scale, the large compass is surrounded by a circular scale 30 to 0 to 30 to 0 to 30, divided to 5 and 1, and numbered by 5. The blued needle is south pointing and the four cardinal points of the compass are represented by crossed lines with a star at north. An inked or painted indicator on the base plate shows a magnetic variation of about 18? W.
The base of the instrument carries a simple circular geometric design as decoration.